David Ortiz: Better With Age? 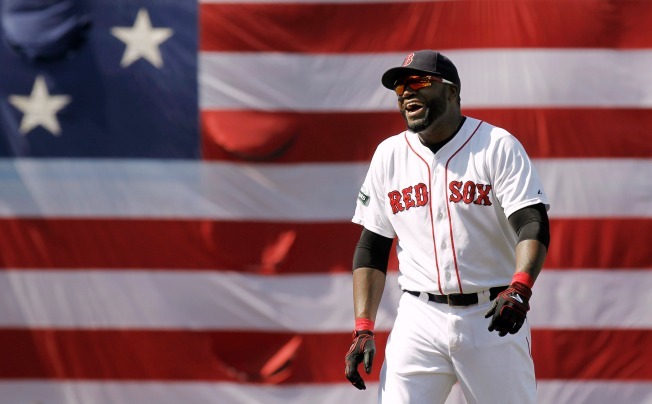 David Ortiz in front of the American flag before the Boston Red Sox played an interleague game against the Washington Nationals at Fenway Park on June 9, 2012. Long before his 500th homer, before his third World Series ring, before he told Boston "this is our f***ing city," David Ortiz's roaring bat seemed to have softened to a whimper, slowly rotting into oblivion. The year was 2010, the slugger 34, his age matching his jersey. He had just played his worst season since joining the Red Sox, and the first month of the new year was nothing short of a nightmare. The cries for Big Papi's release were loud and angry, particularly from the callers on Boston sports radio stations. The previous summer, despite 28 home runs, Ortiz's overall production slipped. He batted just .238 in 2009, and his OPS was a notch below .800. His name, that year, was leaked from a sealed survey of 104 players to test positive in 2003 for a performance-enhancing substance – he still denies ever knowingly taking steroids. Suffice it to say, it had been a difficult year. And through the end of April 2010, Papi was swinging a bat through an abyss, hitting .143/.238/.286 with a single homer. It looked as though a productive career was coming to a sad end. But then something else happened – May. On the first of the month, he hit a pair of homers off the Orioles. From there, he kept going – in the following five months, he hit .286/.385/.558/.943 with 31 homers, 31 doubles and 98 RBI. David Ortiz: Future Hall of Famer? He had entered his second prime. At age 40, there is an argument that Ortiz has had the best season of his career – there is no doubt it's been the best season of his new career, the one that blossomed from the ashes of a career presumed dead. At the end of the regular season, Ortiz had baseball's highest OPS with 1.021. He also led baseball with 48 doubles. His 38 homers are the most a player 40 or older has ever hit, as he's the oldest player ever to hit 35. He's gotten on base more than 40 percent of the time — quite the swan song. Papi's .620 slugging average, the best in the MLB this year, is the second best in a player's final season – second only to another Red Sox legend, Ted Williams, who had a .645 clip in his last year. The old metrics and the new have been similarly kind to the latest incarnation of Ortiz. According to Fangraphs, the all-encompassing offensive runs above average (OFF) calls Ortiz the 11th best hitter overall from age 35 on. Also in the world of sabermetrics, his wRC+, or weighted runs created plus, which more heavily values extra-base hits, has him sitting in a three-way tie at fifth. He, Lefty O'Doul and Hank Greenberg are even at 150, all three trailing just Barry Bonds, Williams, Babe Ruth and Mark McGwire. Less complexly, in that span, he has hit the eighth most home runs with 192, and he has the sixth highest OPS, keeping excellent company behind Bonds, Ruth, Williams, McGwire and Larry Walker. Compare all this to another six-year stretch – from when Ortiz was 27 in 2003 through his age-32 season in 2008. That sample size is larger by 305 plate appearances. In that time, Ortiz hit 231 homers – 39 more than he had in the last six years. He hit 237 doubles then, compared to the 216 he has hit since 2011. His OPS was 0.996 in his first prime – in his second, it has been 0.953. His isolated power – a statistic that subtracts batting average from slugging percentage to highlight a player's power numbers – was an astounding .301 between the ages of 27 and 32, but it's sitting at a still-excellent .271 since he was 35. His 150 wRC+ for the last six years are more comparable to the previous prime's mark of 152. His 598 RBI in his final six seasons don't come close to the 731 from 2003–08, but considering the players who were around him those years, that's to be expected. It should be clear, then, that most of the numbers were better when Ortiz was younger. He was tied with Carlos Delgado for the 10th most home runs of any players from 27 to 32, and Bonds notwithstanding, that's a much more competitive class. But the mere fact that a dynamic slugger could hit so well in his six-year "prime," appear to have slipped into baseball's black hole, and reemerge with six more years comparable to his heyday should be a very convincing argument that he is among the greatest hitters in the history of the game.